• Heating equipment is one of the leading causes of home fires during the winter months. • All heaters need space. 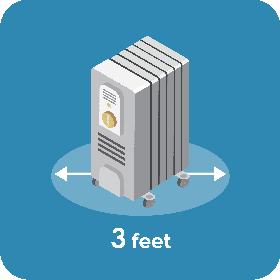 Keep anything that can burn at least 3 feet (1 meter) away from heating equipment. • Have a 3-foot (1-meter) “kid-free zone” around open fires and space heaters. • Maintain heating equipment and chimneys by having them cleaned and inspected by a qualified professional. • Check the Consumer Product Safety Commission Website for space heater recalls, each year before you turn it on.